I can't believe we're already halfway through the Cook It! 2012 challenge! We've made and shared so many awesome staples and recipes so far: pasta, bread, butter, cheese, lactofermented veg (pickles) and now jam. Well, in my case, marmalade. According to the Ball Blue Book Guide to Preserving, a marmalade is nothing more than a jam or jelly with fruit peel suspended in it. 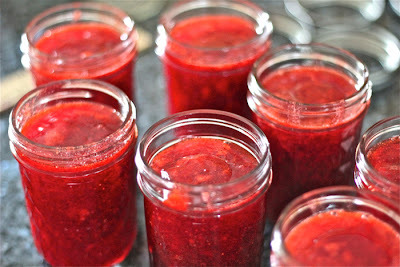 I'd call that jam with zing! 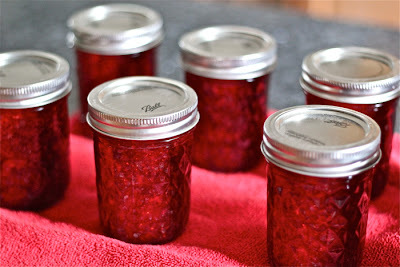 I'm not new to making jams and jellies, so this challenge didn't fill me with any real trepidation. But I did want to do something a little bit different. However, I picked a time when the only fresh fruit to be had was strawberries. 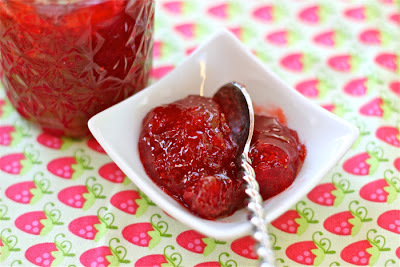 But everyone does strawberry jam and that wouldn't be very Challenge-ish, now would it? In this post, I'm not going to tell you how to can. There are way too many other resources out there that can do a better job than I, so you won't be reading here about how to prepare your jars or lids or anything like that. But I will advise you, if you've never canned before, be sure to read Caroline's tips about trusted resources (e.g., my recipe came from the Ball Blue Book, rather than some random Google search), added pectin vs. natural (I added pectin), ratios, etc. Canning isn't hard but there are food safety issues to consider. Hey, you don't want to be known forever as the one who poisoned Aunt Betty with your hip food blogging project. 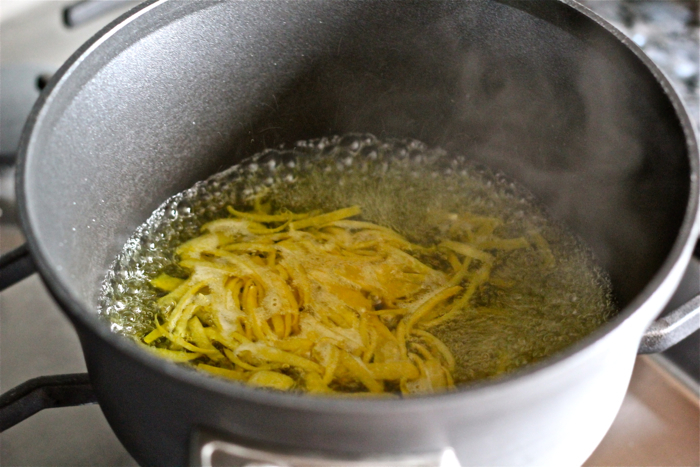 Put the lemon peel in a small pot. Cover it with water, bring it to a boil, boil for 5 minutes and then drain. 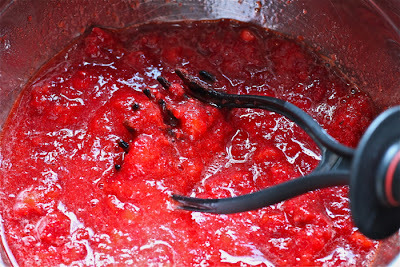 Mash up the strawberries with a potato masher and put in a large pot. 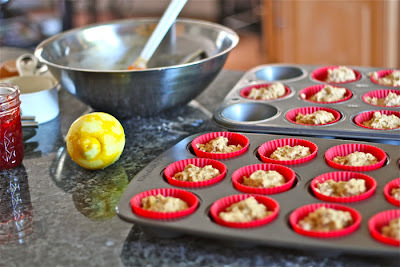 Add the lemon peel, lemon juice and pectin. Slowly bring this mixture to a boil, then add the sugar, stirring until dissolved. Bring it to a rolling boil (meaning, you can't stir away the boil), then boil hard for one minute, stirring the whole time. 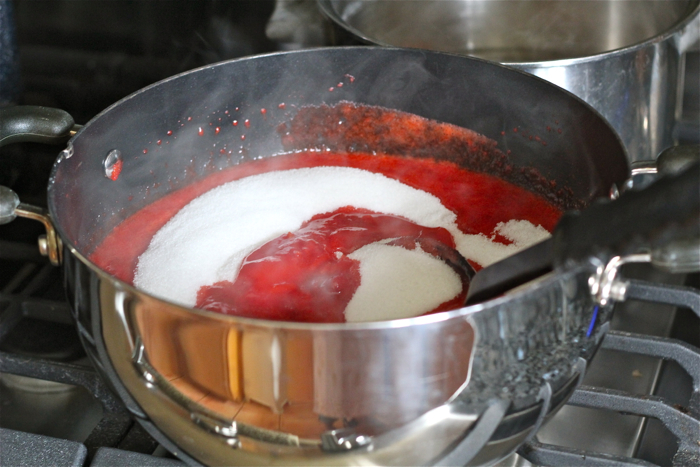 Remove the pot from the heat and, using a slotted spoon, skim off as much foam as you can. Ladle the marmalade into hot, prepared jars (be sure to leave about 1/4 inch headspace) -- I got eight half-pint jars from this batch. Wipe the rims with a clean damp cloth and add the 2-piece caps (finger tighten only). 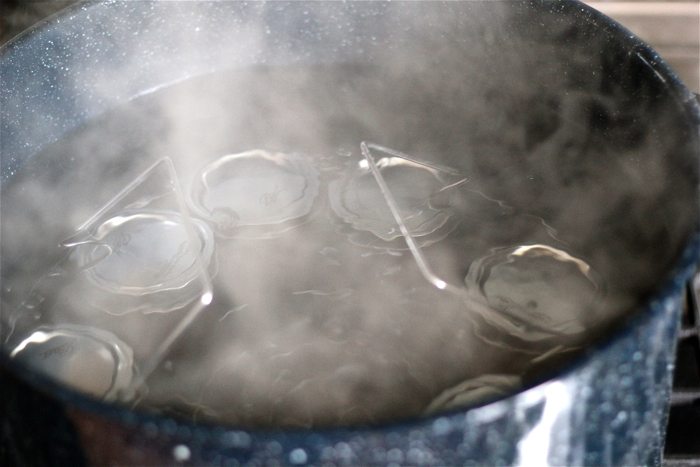 Process 10 minutes in a boiling water canner (start timing only once the water returns to a boil). 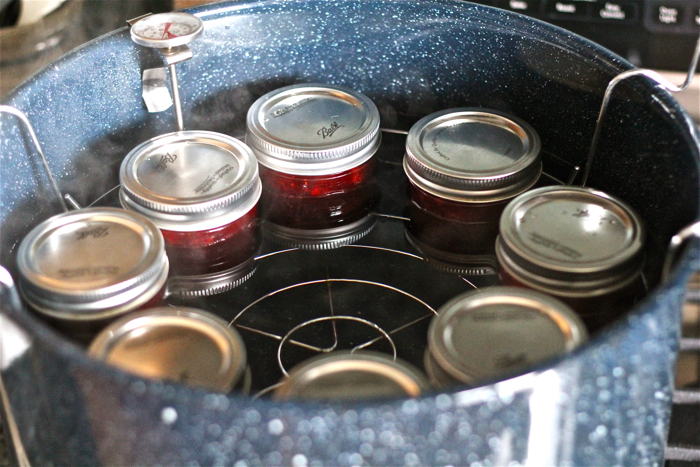 When the time is up, turn the heat off, remove the lid from the canner and let the jars sit in the water for about five minutes. Carefully remove the jars and let sit for about 24 hours before testing the seals. Now, you can certainly just stop here and enjoy the fruits of your labor slathered on some toast (it's like strawberry jam with zing! ), mixed into a cup of yogurt or shared as a hostess gift. But that's not how We of the Challenge roll, is it? Now is the time on Sprockets when we make a new recipe from our staple. 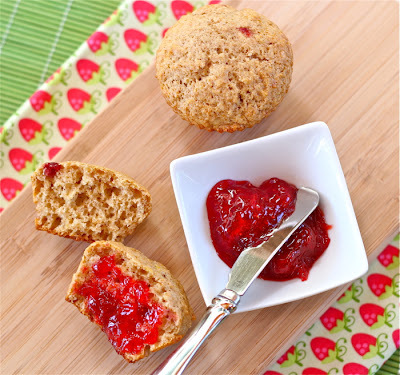 What I made with my marmalade was jam muffins (well, marmalade muffins, since I technically made marmalade rather than jam). These muffins are exactly what you'd expect from the Ninj, if you're a regular reader: easy to prepare, not too sweet, reasonably healthy and perfect for breakfast or with a nice cup of tea in the afternoon. 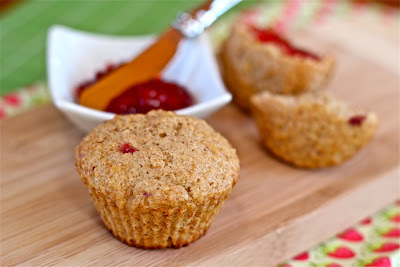 As always, be sure to let me know if you try making this marmalade or the muffins! Combine the first six (dry) ingredients in a large bowl. In another bowl, whisk to combine the remaining five (wet) ingredients. Add the wet mixture to the dry and stir until just moistened. Pour the batter into prepared muffin tins (this made 18 muffins for me). Bake for about 20 minutes (begin checking after 15). Cool completely on a wire rack. Can be served as-is or with butter and extra marmalade. You can always freeze them, Eileen! 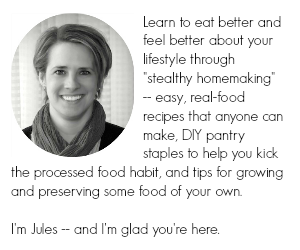 Jennifer: read up on safe canning techniques, which I noted that I couldn't cover in detail. It's not an organic / I'm-lazy kind of thing, it's a food safety thing. I've made 3 recipes of this recipe and it is DELICIOUS!! It's like a burst of surprise when you bite into the lemon. Described as strawberry lemonade on a biscuit. Thank you for the recipe. So glad I tried it. Happy to hear that you're in love with it, Judilicious -- thanks for the feedback!